Porcelain or ceramic tile can be colorful and versatile. They are a beautiful way to jazz up your kitchen with a decorative backsplash. A backsplash can be paired with natural or engineered stone countertops. Then it takes center stage with the opportunity to treat it like an artist’s canvas. You can select ceramic tile backsplash designs that showcase color, pattern, or texture. Whatever you choose, it will provide a unique look. This look will enhance your Brooklyn, Manhattan or Queens kitchen. 1 Should you choose porcelain or ceramic tile? 3 When is backsplash tile installed? 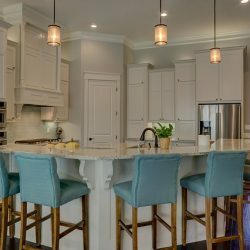 4 How do I choose a backsplash design? Porcelain tile for kitchen backsplash is not subject to heavy traffic. It has only minimal waterproofing requirements. You can use your imagination when creating a beautiful design. Deciding between porcelain or ceramic tile is merely a matter of choosing the colors, styles, and patterns. You just need to decide which you like best. Porcelain tile for kitchen backsplash is impervious to water. It has a reputation for durability. Ceramic tile is not as durable. The backsplash is the ideal location for a ceramic tile installation that is too delicate for countertops or flooring. Small area, flexible tile options and the opportunity to create a one-of-a-kind design increase your choices. Your options for the kitchen backsplash are nearly unlimited. Mosaic tile is a popular choice for the kitchen backsplash. A variety of custom or pre-determined designs can create a unique look for your kitchen. There is something in addition to ceramic and porcelain tile for kitchen backsplashes. Our beautiful mosaic tile product selection includes natural stone and glass. We provide these in earth tones and vibrant colors. When is backsplash tile installed? 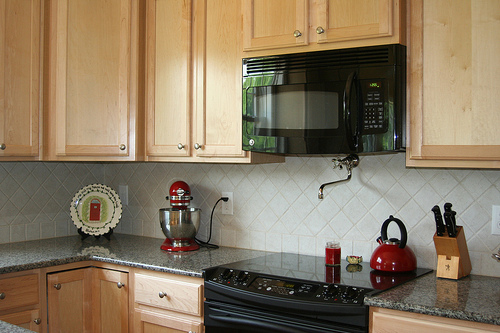 The backsplash is typically one of the finish items in the kitchen. It is important to have the new countertops installed before adding the backsplash. The size and spacing of the porcelain or ceramic tile backsplash designs can be as precise as possible. Backsplash is one of the final items in the kitchen. Try porcelain or ceramic tile samples that will pair beautifully with your countertops. Think of how to pair them with other elements of the room. 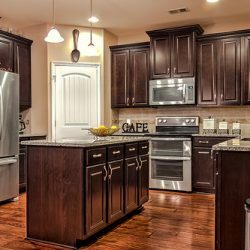 How do I choose a backsplash design? There are several considerations when choosing the ideal design for your kitchen backsplash. Home Art Tile Kitchen and Bath offers many beautiful tile choices. Here are some ideas to consider. • Is this the right location for bright colors? 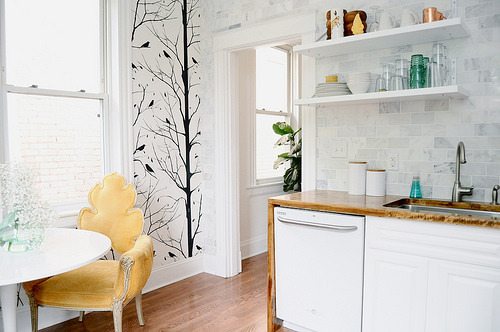 Maybe you are looking for a pop of color in your kitchen. Perhaps you want a contrast to the rest of your decor. The backsplash is the ideal location to implement your unique ideas. • Will a busy pattern be ideal? Perhaps the rest of your kitchen includes monotone colors or simple designs. A busy backsplash pattern provides a pleasant contrast. 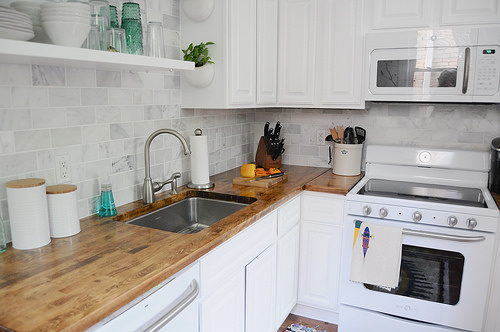 Maybe your countertops include beautiful natural veining. Maybe your flooring is patterned. Then your backsplash may benefit from a simple design. This design will not detract from the rest of your elegant decor. • Dark colors or light colors? Perhaps you have chosen a contrast of dark and light finishes for your countertops, cabinetry, and flooring. Then your backsplash is an integral part of this design scheme. You can combine dark and light ceramic or porcelain tile for kitchen backsplash You can also choose a pattern that will complement or contrast with the elements of your choice. You can choose from many tile options. Choose your porcelain or ceramic tile backsplash designs. This is an excellent opportunity to express your personal style. Many patterns, colors, and designs give you the chance to create a unique backsplash. This backsplash can perfectly complement your kitchen decor. It can create a focal point. This can give your kitchen a custom look. With porcelain or ceramic tile backsplash designs, you can create the perfect look for your kitchen. Contact us today for a free estimate.